Spy shots of the Ford Aspire Titanium Blu variant have surfaced on the internet. With the Aspire already having a proper Titanium Plus variant, the Aspire Titanium Blu could be more of a cosmetic enhancement on the Titanium Plus variant. Expected changes on the Aspire Blu are blacked out grille, wing mirrors, roof and wheels. On the inside, expect the Aspire Blu to have all-black interiors with blue inserts on the door pads and blue stitching on the seats. The Aspire Blu will get a 1.2-litre Dragon series petrol engine and the familiar 1.5-litre TDCi diesel engine. Don’t keep expectations high on the 1.5-litre Dragon series petrol engine with the 6-speed automatic as that is not available on the top-end Titanium Plus trim of the Aspire. Ford Aspire prices start at Rs. 5.71 lakh for petrol and goes upto Rs. 8.86 lakh. The prices of Aspire diesel variants start at Rs. 6.72 lakh and the top-end diesel is priced at Rs. 8.41 lakh. Ford Aspire is available in 13 variants and 7 colours. 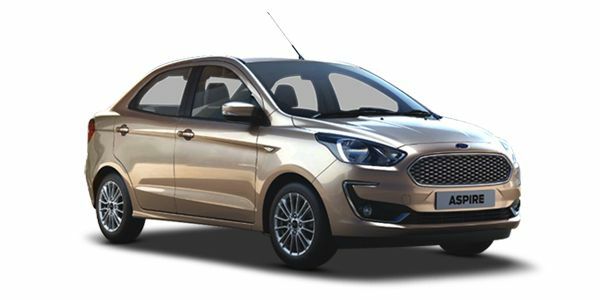 The claimed ARAI mileage for the Ford Aspire petrol is 20 kmpl, and for the Ford Aspire diesel is 26 kmpl. In the sub-4 metre sedan space, the Aspire is among our favourites. If the slightly cramped cabin doesn’t bother you and you’d rather have additional airbags over daytime running lamps, this is the one to get! Q. Honda Amaze, Ford Aspire and Ford Freestyle in which car back seat is comfortable? Sorry to be partial. But luv Honda Amaze back seat just for the space. Luv my driver seat much more. Q. Honda Jazz CVT vs Ford Aspire automatic, which one is better? With the facelift, Ford has managed to iron out a lot of wrinkles in the Aspire’s package. It packs in not one, but two new petrol engines and two new gearboxes too. It continues to offer the stellar safety package but misses out on a bit of bling and falters a bit in the space and quality department. Priced aggressively, we think the Aspire is a phenomenal value-for-money package. It’s amongst the few cars that can pretty much do it all. As far as facelifts go, the treatment dished out to the Aspire isn’t extensive per se. It gets new front and rear bumpers, a new grille and a set of bigger 15-inch alloy wheels. While we like the pattern on the gunmetal-finished grille, we really think the Aspire could’ve done with a snazzier set of wheels. The bigger and wider tyres are also welcome, but they sadly aren’t standard across the range. Also, the Aspire misses out on a bit of bling — projector headlamps, daytime running lamps are missing from the package. Inside the cabin, there are two changes you’d pick on. For starters, there’s a touchscreen on the dash. That dated music system has been thankfully chucked in the bin. Second, you don’t get leather upholstery anymore. Also, small issues prevalent in the pre-facelift version continue to plague the Aspire. For example, the co-driver’s seat brushes against the centre console, there are no bottle holders in the rear doors and the central armrest doesn’t have cup holders either. In terms of space, there’s enough for a six-footer to sit behind his/her own driving position. But, headroom isn’t all that great, especially in the rear bench. In terms of features, you get a 6.5-inch touchscreen (lower variants get an 7-inch unit), automatic climate control, automatic headlamps and wipers, steering-mounted audio control and a bigger, updated multi-info display (MID). The top-spec Aspire is the only car in its class to offer side and curtain airbags, which bumps up the safety quotient. All other variants feature dual airbags. Anti-lock brakes with EBD and seatbelt reminders (for both front occupants) is offered as standard as well. Notably, the automatic also features ESP and hill hold. Ford has ditched the old 1.2- and 1.5-litre petrol engines for a new pair. These engines too displace 1.2- and 1.5-litres, but they’re three-cylinder engines unlike the old four-cylinder units. But, we’re glad about this switch. Especially with the 1.2, because it has transformed the petrol Aspire into what’s an equally desirable package as the punchy 1.5-litre diesel. With 96PS of power and 120Nm of torque on tap, it ranks high in top trumps too. But the new gearbox ratios are tall and tend to sap some of the drive that we appreciated in the Freestyle. In our tests, the Aspire petrol-MT took 12.01 seconds to reach 100kmph, that’s on par with rivals such as the Maruti Dzire and the Honda Amaze. As far as efficiency goes, it returned 15.92kmpl inside the city and 19.52kmpl on the highway. The 1.5-litre petrol is borrowed from the EcoSport and makes a mouthwatering 123PS and 150Nm of torque. Instead of a dual-clutch automatic, it now gets a 6-speed torque converter setup. The 1.5-litre diesel soldiers on with 100PS of power and 215Nm of torque. But it gets a newer gearbox that’s far better than the old one. This engine is also super fuel efficient, and we’d recommend it over the petrol if highway usage is extensive. If you’ve narrowed down on the Aspire, you get to pick between five variants - Ambiente, Trend, Trend+, Titanium and Titanium+. While the 1.2-litre petrol and 1.5-litre diesel engine is available in every variant, the 1.5-litre petrol paired with the automatic is available in the Titanium variant only. The base-spec variant packs in the basics, including front power windows and manual air-conditioning. But pretty much everything else is missing. So, it’s a skip from our side on this one. And, we’d say the same thing about the Trend variant too, because additions like the music system, rear power windows and remote keyless entry don’t wholly justify the price bump. In our opinion, you should get the Trend+ variant if you’re on a strict budget. Because, for about 50k over the Trend, you get a whole lot more: a 7-inch touchscreen, reverse parking camera, front fog lamps, automatic climate control, steering-mounted audio controls and powered ORVMs. All this variant needs are some good looking 15-inch alloy wheels from the aftermarket! Next up, is the Titanium variant: that’s your only choice if you want an automatic. The feature additions aren’t all that great for the added cost - you get 15-inch alloy wheels, push-button start and some chrome peppered on the grille and the handbrake lever tip. Finally, there’s the Titanium+ that adds the side and curtain airbags, a 6.5-inch touchscreen with Android Auto and Apple Carplay and the finer details like auto-dimming IRVM, auto headlamps and rain-sensing wipers. Maruti Suzuki Dzire : The Maruti Dzire sits at the top of the compact sedan segment quite comfortably. The new generation has improved by leaps and bounds, and is among your best bets if you’re looking for a compact sedan. Hyundai Xcent : Based on the Grand i10 hatchback, this compact sedan combines space and practicality of a larger car with the reliability and low cost of ownership associated with the brand. The Xcent is not as spacious as the competition but has one of the better-built interiors. The Xcent does not get a diesel automatic variant, unlike the Ameo or the Dzire. Honda Amaze: Honda’s second-generation Amaze brings a lot to the table. Plenty of features, a spacious cabin, a refined petrol engine and a fun diesel too. The CVT stands out in a sea of jerky AMTs. Add the allure of the Honda badge, and you’ve got a product that appeals to the head and the heart! Volkswagen Ameo: The middle-child in Volkswagen’s lineup is exactly what you think it is. It’s a Polo with a boot. Pick it only if you need a diesel automatic or a bigger boot. For everything else, the Polo works just fine. Tata Tigor: The Tigor looks like a good overall package with decent equipment and frugal engines - though these are best used in the city. The JTP variant, on the other hand, caters to the budget-conscious enthusiast who would have had a hole burnt in their pockets earlier. With the recent update, Ford has plugged all the gaps in the Aspire’s arsenal. The new petrol engine is almost as fun to drive as the diesel. It’s amongst the most value-for-money compact sedans on the market today!